Take a visual journey through the ideas of the local student body. Featuring the winning art piece of the Cardiff 101 competition for Small Business Saturday as well as an inside look into the young minds of Cardiff, how they feel about art, growing into adulthood and the community. Student Artists from left to right: Marina Alberti, Madi Logan, Jenna Price, Lola Taylor and Marisa Prange. Absent from photo: Hannah Elliott and Sienna Griffin. Cardiff 101 main Street was thrilled to partner with with local Cardiff Artist and San Dieguito High School Academy Art Teacher, Angela Jackson for Small Business Saturday on November 24th. 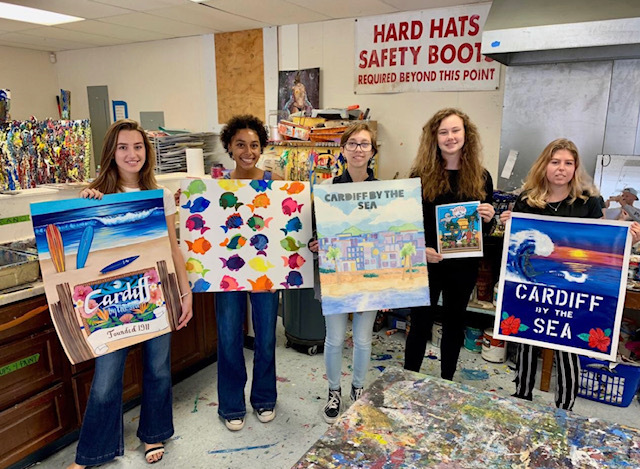 We thought it would be fun to create an art contest for her students at the school to create a piece that represents Cardiff-by-the-Sea using imagery, color, texture, typography, design and whatever else spoke to them. The winning submission will be printed and the Limited Edition Art Work will be given to shoppers at Small Business Saturday when they shop at participating Cardiff businesses﻿. In addition there will be opportunities to get a free print by shopping at the Cardiff 101 booth, signing up for our newsletter, joining as a member, and through our Instagram contest to win the Limited Edition print.